On the 19th May this year, David Cameron, triumphant from a largely unexpected general election win a week earlier promised to push on with the EU referendum. The Guardian headline of 19th May read “Cameron to publish EU referendum bill one day after Queen’s speech.” That was 27th May. On the 10th October this year, The Daily Telegraph headlined “David Cameron’s four key demands to remain in the EU revealed and wrote “David Cameron and his Cabinet allies name their price for Britain to stay part of Europe”. The article covers exactly what David Cameron sees as a vision for Britain. The Telegraph continued “Details of the Prime Minister’s negotiation plan remain secret. In a tactic that has infuriated EU politicians, Downing Street has refused to send a written list of Mr Cameron’s objectives to Brussels.” And, “Diplomats have been sent to win support from 27 European countries for a new deal between Britain and Brussels ahead of an “in-out” referendum. A new campaign will start on Monday (12th October) in an attempt to persuade voters to choose to stay in the EU. On Saturday 7th November, The Independent ran with the headline “EU referendum: David Cameron to warn against accepting status quo as he issues wish list of demands“. According to a No 10 source, the “temperature is increasing, things are stepping up” in negotiations with the EU over reform.” The source said the UK was entering a period of “intensive political contact with member states”. From that we should assume that negotiators on the British side were working towards the four key points outlined a month earlier. Apart from the confusing element of what details may or may not be issued to A) the general public and B) Brussels – there is, in the space of just about one month a huge shift in this policy. All of a sudden there is no “forcing Brussels” to make an explicit statement about anything, let alone Britain’s exclusion from the EU superstate. There is no mention of the demand that the Euro is not the official currency of the EU or indeed explicitly confirming the status of the pound Sterling. There is no mention of bringing back powers to Britain and scrapping existing EU laws and no mention that the 19 member states within the eurozone cannot dominate over the nine that are not. 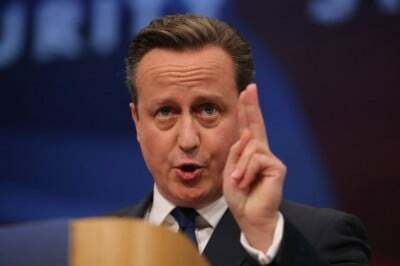 Some newspapers opined that David Cameron won the 2015 election based on a manifesto of lies and deception. He stood accused of the denial that child tax credits would be cut. He denied child benefit cuts beyond a two-year freeze, he redefined the timing of tax-free child care, reversed a pledge for greater government transparency after launch of the review into freedom of information (a charter for government cover-ups), and the list of U-Turns in the previous parliament are legendary that includes; no frontline cuts to public services, protection of the NHS budget, more police officers, keeping VAT at 17.5%, keeping education maintenance allowances, etc. It is surprising that elections take place at all with the total collapse in confidence of politicians. Politicians are not just the least trusted people and profession in society but the most likely to outright lie for self-serving interest according to an Ipsos Survey. The Conservative party strategy to gain power in 2015 was based around a fear and smear campaign, the current campaign of aggression to discredit Jeremy Corbyn is both comical and ludicrous so far ahead of the 2020 election and the Scottish referendum was dubbed “hope over fear” after big business and even the Bank of England threatened isolation, unemployment and capital flight. Inevitably, the campaign to accede to America’s demands and the corporatocracy will centre around fear. Expect more rhetoric, deception and propaganda particularly focused on national and economic security. In other words terrorism and corporations who stand to benefit from TTIP. The general public would vote about 37% ‘OUT’ today but this vote has gained considerable ground by around 9% from June to September this year. The ‘IN’ camp currently stands at 45% and this is an all time high. There is much for both sides to play for.